<h2>Robotic bugs train insects to be helpers</h2><br /><p>With a soft electronic whirr, a rather unusual looking ant trundles along behind a column of its arthropod comrades as they march off to fetch some food.</p> <p>While the little insects begin ferrying tiny globules of sugar back home, their mechanical companion bustles forward to effortlessly pick up the entire container and carry it back to the nest.</p> <p>It is a dramatic demonstration of how robots can be introduced and accepted into insect societies.</p> <p>But the research, which is being conducted as part of the EU-funded CyBioSys project, could be an important step towards using robots to subtly control, or work alongside, animals or humans.</p> <p>‘The idea is to be able to solve (a) problem with a better solution than they (the robots and insects) can produce individually,’ said Dr Bertrand Collignon, who is leading the research at the École Polytechnique Fédérale de Lausanne, in Switzerland.</p> <p>The robots, which ‘live’ with the ants, pick up signs that food has been discovered through a camera mounted inside the nest. 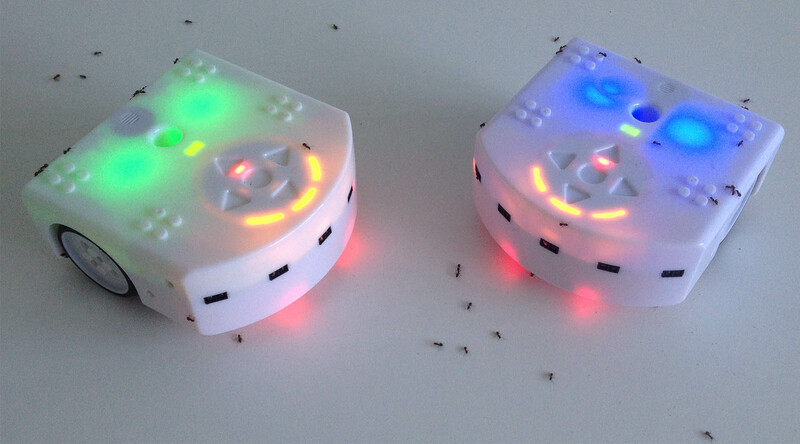 The camera alerts the robots when it detects an increasing numbers of ants are departing – a sign that food has been found.</p> <p>The robots – reprogrammed off-the-shelf Thymio bots managed by simple Raspberry Pi computers&nbsp;–&nbsp;then use sensors to follow the columns of exiting ants. Once the ants have led their robotic counterparts to their discovery, the robots take over, using their superior muscle power to lug it home. &nbsp;</p> <p>Dr Collignon described this as a ‘cyber-biological system’, which improves both on the natural order, and on what robots could achieve on their own. By getting ants and robots to collaborate, each community plays to its strengths, he says.</p> <p>‘The ants are good at exploring the environment very efficiently, with many scouts patrolling the vicinity of the nest at the same time,’ said Dr Collignon, who is a Marie Skłodowska-Curie action&nbsp;fellow. ‘But individual ants are not able to transport large amounts of food and some can get lost between the food and the nest.’</p> <p> <div class="quote-view quotesBlock quote_horizontal"> <div class="quotesTop"><img src="https://horizon-magazine.eu/sites/all/themes/horizon/images/quotes_top.png" alt="" title="" /></div> <p>‘By getting ants and robots to collaborate, each community plays to its strengths.’</p> <blockquote><p>Dr Bertrand Collignon, École Polytechnique Fédérale de Lausanne, Switzerland</p></blockquote> <div class="quotesBottom"><img src="https://horizon-magazine.eu/sites/all/themes/horizon/images/quotes_bottom.png" alt="" title="" /></div> </div> </p> <p>Robots are like pack animals in comparison, carrying an order of magnitude more food than an ant can, and accomplishing in a few minutes what would have taken the ants hours.</p> <p>Dr Collignon believes it is the first project to consider an insect swarm as a biosensor and then embed in a robot the ability to extract data from the colony.</p> <p>But he also&nbsp;believes this research could be combined with other work teaching robots to communicate with animals. Instead of relying&nbsp;on top-down instructions — like a shepherd dog herding sheep — this would work by&nbsp;subtly influencing them from a position as one of the group. &nbsp;</p> <p>As many social insects such as ants and bees can form aggressive colonies that normally do not respond well to outsiders, influencing them from within may offer a new approach.</p> <p>In a previous EU-funded project, <a href="http://cordis.europa.eu/news/rcn/28694_en.html" target="_blank" rel="noopener noreferrer">LEURRE</a>, a team pioneered the creation of small mobile robots that could interact with cockroaches and influence their collective behaviour.</p> <p>When kept in a pen together, cockroaches will gradually gather under the same dark shelter. They achieve this simply by following two rules: stay close to other cockroaches, and head for somewhere dark.</p> <p>But when the researchers released small robots into the pen programmed with slightly different rules — stay close to other cockroaches but prefer a lighter refuge — in time the cockroaches, along with the robots, gathered in the lighter shelter instead.</p> <p>Dr Collignon believes that the two types of robotic work – collaboration and communication – could find applications in search and rescue, exploring environments too dangerous or inaccessible for humans. Eventually, small animals could be used to get into restricted environments such as collapsed buildings.</p> <p><a href="http://bit.ly/newsalertsignup" target="_blank" rel="noopener noreferrer"><img title="Sign up for our newsletter" src="https://horizon-magazine.eu/sites/default/files/news-alert-final_0.jpg" alt="Sign up for our newsletter" width="983" height="222" /></a></p> <p>By integrating artificial systems, such as robots, into more natural ones – such as a warehouse full of chickens – it could lead to new solutions to help control animal behaviour on farms. An example might be preventing deadly mass panic attacks amongst intensively reared animals by using robots that can detect the early signs of an impending stampede and diverting one by behaving in a different way.</p> <p>‘The first step is to be able to track what natural agents are doing and react appropriately to that,’ he said. ‘That’s already a tricky thing. Once you have sensed what nature is doing, you can then interact. The robotic agent can do what it has been designed for and then act on the system.’</p> <p><em>If you liked this article, please consider sharing it on social media.</em></p> <br /> <img src=”http://www.google-analytics.com/collect?v=1&tid=UA-40077089-1&cid=robotic-bugs-train-insects-to-be-helpers&t=event&ec=republish&ea=read&el=robotic-bugs-train-insects-to-be-helpers&cs=republish&cm=republish&cn=republish&cm1=1" /> This post <a href="https://horizon-magazine.eu/article/robotic-bugs-train-insects-be-helpers.html">Robotic bugs train insects to be helpers</a> was originally published on <a href="https://horizon-magazine.eu/">Horizon: the EU Research &amp; Innovation magazine | European Commission</a>.